You may be thinking about attending one of the embroidery trade shows in 2019, but don’t quite know if it’s worth the effort. Attending a decorated apparel industry trade show can provide opportunities for your business to grow and flourish, but attending can also cost a pretty penny and put the brakes on job production while you are away. Trade shows for the embroidery and decoration apparel industries take place in many cities around the country. These gatherings bring together industry experts, business owners, manufacturers and suppliers all under one roof in a setting that promotes business, education, and fun. You could view going to a trade show as an investment. You get the chance to meet people who own similar businesses, discover new products that could give your business a boost, and learn new skills. In fact, the upside is so great, it would be a shame to miss out on all potential profits to be made. 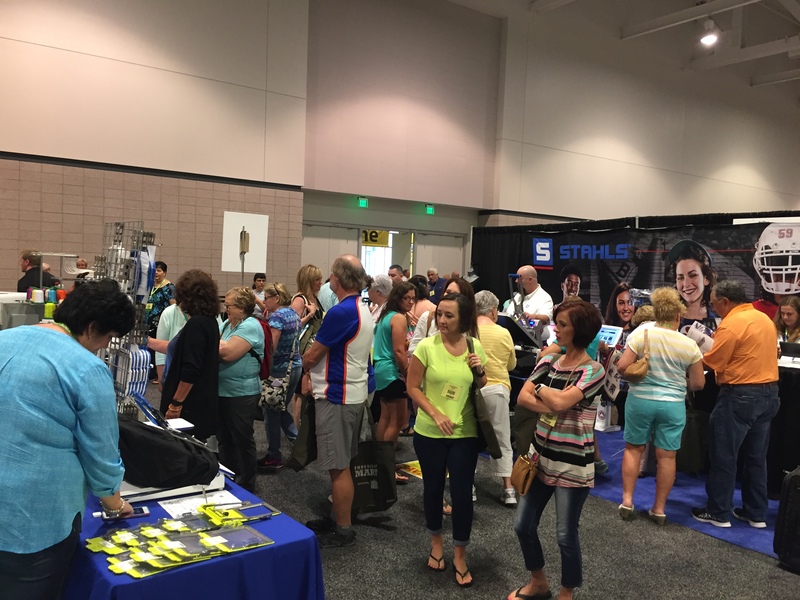 Here are 5 simple reasons why you can’t afford NOT to take time out of your busy schedule to go to an embroidery and decorated apparel industry trade show. It may seem easier to buy from the same supplier from the convenience of your business, but are you going to get the best information, prices and offers from a single source? At a trade show, the exhibitors are competing for your business. Competition is healthy. Trade shows let you meet with and evaluate multiple suppliers in just a few days. It is the most efficient way to make "apples to apples" comparisons before you make equipment and key supplier decisions. Trade shows provide easy access to information and a more efficient way to make business decisions. Have you purchased what seemed to be the greatest item in the world from a catalog or the internet and then realized it was not the size, version, or quality you expected once it arrived? It is tough to gauge the quality of a product in a catalog that is new to you. At the trade show, you can see it, touch it, and feel the quality of the products yourself. Selling these products to your customers will be much easier when you have first-hand knowledge of them. Trade shows host a seemingly endless array of suppliers promoting their products in the booths. Get up to date on industry trends, discover new products, and discover ways to increase business for your company. Even the trade show booth displays could present a solution to a problem you weren’t aware of or offer ideas for how you can your boost business. Every booth has the potential to spark your next business move, product idea, display, promotion, or change. Trade shows offer visual examples of what is popular. Where are the biggest crowds? Large crowds could imply a new or popular product or industry trend. Who knows what solutions you could discover? Trade shows are filled with people who work in all the various areas of our industry. Ultimately, networking and connecting with others in the industry is a wonderful tool to grow your business and expand your reach. You never know who will recommend your business because they met you—and liked you—at that one trade show you went to. Trade shows are filled with educational sessions designed to help you explore and learn about the embroidery and apparel decoration process. Keep up-to-date with the latest developments, trends, techniques and new technologies to ensure that your business is competitive. It may be hard to fit education into your schedule as your main goal might be to spend all your time in the exhibit hall. However, if you are willing to give up some short-term goals for long-term success, attending educational sessions is a no-brainer. Prioritize the sessions that are most related to your business and determine how you can fit them into your schedule. Take notes during the classes to remember actionable information to be applied once you get back to your business. Network with industry leaders at competing booths. They might share some insights to help you improve your products or production process. This is just another reason why attending a trade show is a good idea. I suppose, when it comes down to it, the best reason to attend your industry trade show is that there is no reason not to; you have nothing to lose and everything to gain. Many of the embroidery and apparel decoration trade shows are free if you register in advance or if you receive an invitation from one of your suppliers. If the trade show isn’t free, part of the cost could be written off in your taxes as a business expense (just be sure that you are doing this lawfully). Overall, you should look at attending your industry trade show as something that will yield a return of investment. Attending your industry trade show is an investment in your business and your future. On top of the practical reasons to attend, there are some fun perks too! Trade show booths may offer free and useful items as promotional materials. 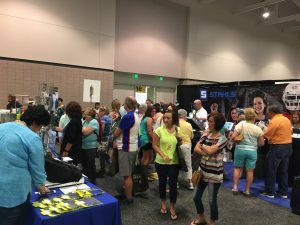 Oftentimes, trade show vendors have special discounts on their products, raffles, or contests to encourage attendees to check out their trade show booth. You’ll leave feeling like you just won the showcase prize on The Price is Right. Yes, you are there for your business. But trade shows and the social events at them are excellent places to network. Say Hi and meet other people working in your industry at the table when you grab lunch, in line for coffee or on the escalator. Swap recommendations with them of who to seek out at the trade show, what caught their eye. Sometimes guest speakers and exhibitors will also attend the social events of a show, which gives you the opportunity to gain insight from them you wouldn’t have in the exhibit booth setting. This may seem silly, but don’t forget to have fun. Try to treat trade shows as a “workation” – you’re there to expand your experience and contribute to your business but you also get to spend a few days away from your business. Explore a new city and make some new industry friends while you’re at it. Because trade shows are normally held in interesting locations, attending your industry trade show can be a good way to check out a place you always wanted to go to. With your busy schedule, it can be difficult to fit in a trip to Atlanta or Las Vegas or Nashville, but attending a trade show is great way to justify such a vacation. So grab your sunglasses and pack your bags! If you’ll be in Atlanta, Nashville or Indianapolis for the NNEP's Embroidery Mart trade show this year, we would love to meet so don’t forget to stop by our NNEP booth. We’ll be there all day! Attending an industry trade show should be viewed as an investment. Trade shows and conventions offer a place to build your network, spread the word about your business, evaluate the suppliers you use, find new products and learn new skills. Plus, you might get to discover a cool new city! Rather than asking yourself if you can afford to go, you should ask if you can afford not to. In a nutshell, attending a trade show is an investment of a couple of days which keeps you away from your business, but you can manage months of work in those few days. That is a massive savings of your time, and that’s good value! Previous: Previous post: Recommendery: Feed your Brain & Grow Your Profits!